You’re busy and need to delegate. That’s where I come in. As an ARTrepeneur, my global clientele appreciates the professionalism, flexibility and fresh take I bring on board finding solutions to creative challenges. Collaborating with you, together we’ll develop a plan to meet your deadlines and budget. Individuals and corporations large and small hire me on projects large and small. Perhaps you need a simple illustration for your print ad. You’re launching a new line and need fashion illustration pronto. Or maybe you’re in the market for storyboards and concept art to get that pitch off the ground. Are you re-branding? Sometimes folks need a consultation just to bounce ideas and get feedback. My management team has a great animation department if you’re pre-visualizing anything from a commercial to a film trailer to a show opener to a product demo. Or Maybe you’re developing an app or game and need a creative boost or simply to outsource a bit to meet your delivery date. Hit me up on my contact page and let’s see if we’re a good fit. 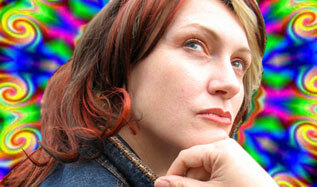 I bring my vast experience in multiple disciplines to the table to help you solve your creative problems. I also ride motorcycles, enjoy Thai food and long walks on the beach. While having a niche is nice, the underlying architecture of my successful career has been built upon a foundation of flexibility, allowing my creativity to gleam and glide across the span of all media arts. Many clients call me a modern renaissance woman - My Name’s Renee - Which comes from the same french root word as Renaissance. The basic tenets of Renaissance Humanism, considered people limitless in their capacities for development, and the notion that human beings should embrace all knowledge and develop their capacities as fully as possible. This sometimes makes planning one’s calendar a challenge. Monday I may be making concept art for a McDonald’s commercial, Tuesday could be brainstorming ideas for visually promoting the Discovery Channel’s new season’s lineup, Wednesday has me creating shooting boards for photographers and director’s like Ellen Von Unwerth or David LaChapelle. Thursday may be crafting character design for one of Mr Spielberg’s new brainchilds. Friday is car commercial advertising agency boards for folks like Lexus and Toyota, and the weekend overtime has been a blast designing plush toys for Target. Sunday, I’d better rest, because next week I have set design deadlines for a new network show. My Professional and Academic life and interest in human consciousness has kept me researching a broad spectrum of subjects such as transpersonal psychology, psi phenomena, Eastern and Western philosophy, quantum science, process theory, the neuroscience of creativity and cultural shamanism. Wanting a pony for her twelfth birthday and instead receiving a .22 rifle and an NRA membership, Renee Reeser Zelnick naturally attended art school to avoid the ROTC. 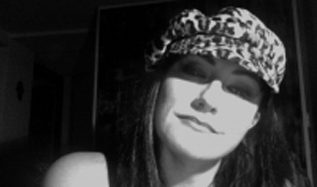 After escaping from Amish country and earning her BFA in Fashion Illustration from Moore College of Art and Design, she ditched Philly for Hollywood, initially working in Beverly Hills art galleries, print shops, fashion and textile design studios by day while being a fabulous club kid by nite. Like a high heeled Dorothy in Oz, the technicolor road to Los Angeles led her to a madly successful career as a fashion illustrator, storyboard and concept artist, illustrating and brainstorming for film, television, video games, fashion and lifestyle brands, books and advertising. An Artrepeneur, this creative media mind serves a global clientele as consultant, coach, brand builder, information artist, illustrator, pre-visualizer and yes, even music producer. Collaborating with the finest movers and shakers on the planet, working on projects for everyone from Tupac, to Spielberg to Oprah. Her past and current projects include clients such as Sony, HBO, Universal Studios, Coca-Cola, Disney, Electronic Arts, Nissan, Land Rover, Old Navy and Nike. And all while wearing sparkly shoes. Renee is also the founder of the humanities project, a foundation that empowers and rewards youth pursuing conscious creativity in the arts & humanities through college scholarships and services. 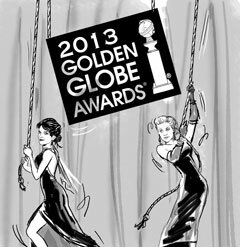 Capturing the madness of the Golden Globes. Kooky key art concepts for Amy Poehler and Tina Fey. 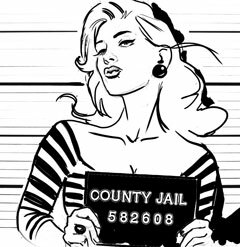 From a cosmetics commercial storyboard, mug shots can be glamorous with the right shade of lipstick. Sofia Vergara has a great head on her shoulders. And great hair. And great other things too. 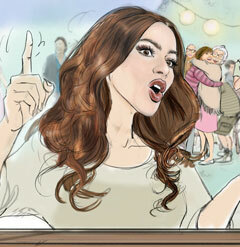 From an international campaign storyboard. Margaritas mix better with Grand Marnier. 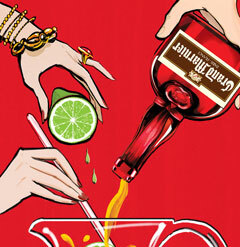 This print ad / poster idea is tasty with tequila and lime.